On the last leg of our flight home, David and I did an A to Z chronicling of our nine day trip back to the Great Midwest. And, here, my friends, are all 26 volumes of our trip. A - For sure, this has to be the new Indianapolis Airport! Oh my gosh - David and I felt like we were in a completely different state (until David pointed out the t-shirts for sale in the shops that said "Nothing Tips Like a Cow"). It is absolutely beautiful and has so many cute shops in it. The only thing missing is our favorite grab-and-go food from the Kolache Factory. Ha ha, on the way back to the airport on Monday, we drove to the OLD airport location (about 5 miles short of the new one) without even thinking! I guess some things have changed since we've been gone. B - David had some business in Elkhart on Thursday, so when he was finished with his meetings, we drove the short 15 miles over to South Bend and toured Notre Dame (where David's dad got his MBA). Olivia fell asleep on her first official college visit (is anyone here really surprised at that?) 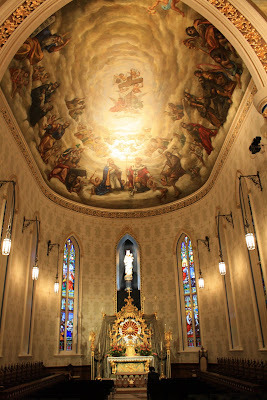 and so I stayed in the car while David toured the gorgeous Basilica on campus. I'm sure the pictures he took don't do it justice. C - Considering we were in TWO different cities both with the name Columbus, our "C" could stand for no other (except, the Caldwell family minus one, would work here too). It was so amazing to spend Sunday and Monday in Columbus, Indiana, my hometown. My two great aunts from Versailles came up and spent a couple hours at my parents' homebase - the Caldwell's house - and friends of mine from their neighborhood also stopped by. Olivia had her first little playdate with my friend Jessica's little baby girl, Emily - which was just hysterical to watch. And, yes, Olivia was totally jealous of all of her hair! 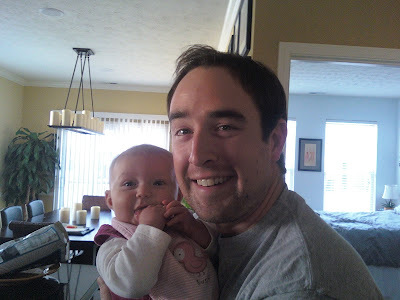 In Columbus, Ohio, my aunt and uncle from the Cincinnati came over and got to meet Olivia for the first time. It was great to see both of them - and we really appreciated the effort they made to come see us. Olivia had a great time tormenting playing with Emily! D - One of the people I was most looking forward to seeing was my friend, Diann. 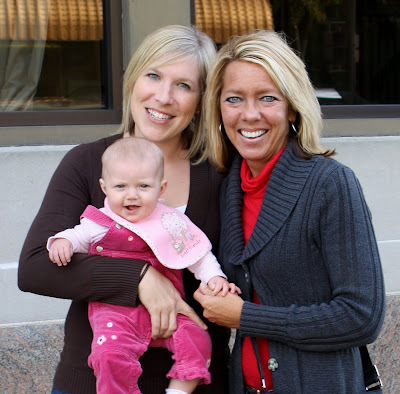 I taught with her for two years and she became my Indianapolis mom and my very good friend. I spent the first Friday night with her, her husband Mike, and her daughter Kelsey (who came all the way down from that other Indiana school where they wear black and gold). You know you have good friends when it feels like you can just pick up right where you left off and that's exactly how it was when I got there. She had a glass of Rosemount Merlot ready to be poured and my favorite stuffed green peppers in the oven. David and I also went back over on Saturday night to hang out with them again because, honestly, one night was just not enough. Did I mention that she also had a Dairy Queen ice cream cake for me? E - We put eleven hundred and two miles on the Buick Enclave rental car over the course of 9 days. And, yeah, I would say that I drove all but about eighty of those miles. I do enjoy driving long drives, especially those where you can just zone out, but on Thursday I drove from Columbus, Ohio to Elkhart, Indiana and I swear we hit every single small town that Ohio and Indiana had to offer. We weren't on any same stretch of road for more than 45 miles so I really had to concentrate, but the drive was still absolutely gorgeous. Okay, how photogenic is my Aunt Patty??!!?? 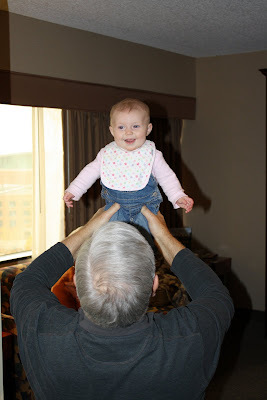 My Uncle Hank lifting Olivia up. Nana was starting to get worked up over that! My friend Andrew/former neighbor. He had never held a baby before!!! G - David and I were fortunate enough to be able to stay at Grandma and Grandpa's waterfront condo up in Cicero during our stay in the Indianapolis area. It was so wonderful to have plenty of room, a sink and a washer and dryer right there for us. Do you know how many bibs of Olivia's I washed out in hotel sinks?! H - Considering we always overpack, I really tried to pack as lightly as possible this trip -- which meant, leaving my hairdryer at home because most hotels have a decent one. However, I neglected to think about the hairdryer situation at Grandma and Grandpa's condo. THIS is what I had to work with. Thank goodness about half of my hair has fallen out since having Olivia or it would have taken me longer than the 25 minutes than it did take me to dry my hair. I - David and I spent the first Sunday and Monday in Columbus and since my parents no longer have a house there, we checked into the new hotel downtown, Hotel Indigo. David splurged and checked us into the Presidential Suite where former President Bill Clinton stayed. The hotel has a really contemporary feel, was totally roomy, and had an awesome little restaurant downstairs. The hotel dog, Miles, was pretty stinkin' cute too. We slept on the same bed that Bill Clinton slept on!! Olivia is "blown away" by the fact that her rear is in the same chair that Bill Clinton's was! J - After our trade show in Columbus, Ohio, we took a stroll through the Short North with my parents and my aunt and uncle and dined on coney dogs and cheeseburgers at a little dive restaurant and then had dessert at Jeni's, an awesome little ice cream shop. They had some insane flavors - Bourbon Buttered Pecan, Gravel Road, Rootbeer (it tasted JUST like rootbeer), and Heirloom Pumpkin 5-Spice. Mom and I went for the Salty Carmel and David went for Pistachio and Honey Vanilla Bean. Such a cute little shop and such delicious flavors! K - HELLO! Karaoke party in the car. Ohio radio stations LOVE 80's Power Ballads and I thoroughly loved singing along to them. Seriously, I heard Livin On a Prayer by Bon Jovi 3 times in the same day. L - Even though I sort of complained a little when we got off the plane because my flip-flop wearing feet were freezing, I was really glad that we went back to Indiana in October. The leaves were just to die for. N - Before I met David, I never listened to NPR, but quickly became addicted. There's just something soothing about Steve Inskeep's voice in the morning that makes mornings a little easier to handle. Out here, we only get a few hours of NPR, so it was a pure pleasure to go back to Indiana and listen to NPR on 90.1 ANYTIME we got into the car! O - Olin and Olivia sitting in a tree, K-I-S-S-I-N-G! Olin is my friend Cole's 15 month old baby boy and he is just tooo cute for words. (Yes, she's that Cole, the one where Olivia's middle name comes from.) We spent our second Sunday afternoon and evening hanging out with Cole and her husband, The Good Doctor, and Olin in their beautiful new house mansion in Meridian-Kessler. It was so great catching up with Cole and swapping baby stories. Cole is pregnant with #2 and the last time I saw her she had that same fabulous belly with little Olin inside. 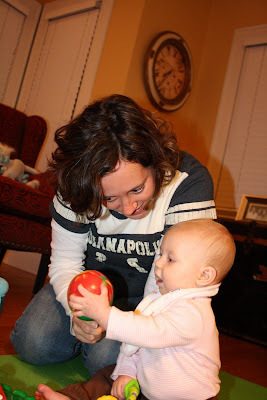 Olin and Olivia had a great time playing together - Olin was so sweet with her. Cole, we definitely have to plan a little Mommy and Baby getaway soon! So sweet - he shared all of his toys with her and was giving her kisses! Big Cole, meet Little Cole. P - Now it wouldn't be Halloween with the Michelsons if we didn't get Magnum dressed up, would it? No Superman this year, Magnum was a good ol' Halloween Pumpkin. Look at that mischievous face?! Q - Would you believe that there were TWO Quinn's on our trip? The first belongs to my very good friend, Tara and her husband, Cash. They met up with us in Columbus on our first Sunday in town. Quinn was born six weeks ahead of Olivia, so it was awesome during our pregnancy and then once the babies were born to exchange stories and to see what I should be expecting. Up until that Sunday, we had only seen pictures, so it was great seeing the real deal in person and being able to get our hands on each other's babies. Quinn is so adorable and is just as laid-back as can be. I wish that we lived closer to each other so that our two little babies could grow up together. The second Quinn belongs to my favorite eye doctor in the whole world. (See letter V) We didn't get to meet him, but we saw tons of pictures of that cute little guy! R - Well, it wouldn't be a Michelson trip if it didn't involve indulging in some chain restaurants. When David and I drove into Noblesville, our minds were racing with what we were going to eat first. Chick-Fil-A was the winner of that battle, but never fear that Cracker Barrel, Texas Roadhouse, Qdoba and Culver's were all visited as well. We even passed a Rax and sooo wanted to stop by, but it was breakfast time. Cheeseburger in Paradise - you'll have to wait until next year! 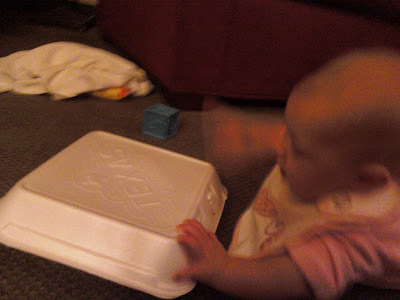 Check out Olivia going after my Roadhouse Ribs! Did anyone know that these still existed? S - Since we spent an extra day in Columbus (instead of heading over to Bloomington), we were able to take Olivia out to Southside Elementary School where I taught for three years after graduating from college. 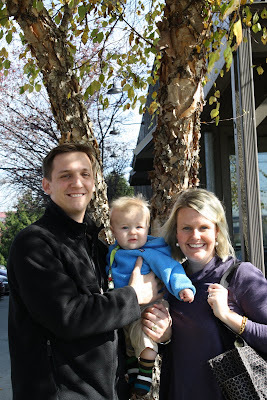 I loved being able to see some of my former colleagues and introduce them to David and Olivia. There was even one student still there who I worked with when he was in kindergarten. Man, do I feel old! T - Getting inspired by Lauren and Kiel and their adventures in hunting out dive restaurants, we spent the first evening in Columbus, Ohio at Thurman's Cafe which boasts about their special, The Thurmanator - 2 12-oz burgers, mayo, tomato, lettuce, pickle, hot pepper, bacon, cheddar, sauteed onion, mushroom, American and provolone cheese on a bun. None of us were brave enough to try it, but my dad and David both went for the Jumbo wings. Leave it to a dirty dive restaurant for us to get a cute picture! Olivia opted for giraffe instead of chicken wings! U - We flew United this round and while the extra 5 inches of legroom we upgraded to were well worth it, the stewardess who made me take Olivia's poopy diaper back to my seat got me a little ticked off. V - Due to non-friends/family members reading WAY too much into my blog and not appreciating it for what it is - a way to share pictures of Olivia and our adventures with people who don't get to see us all the time - the actual "V" portion has been removed. W - Nothing makes me feel more at home in Indiana than turning on the radio to 92.3 WTTS. Sunday morning we drove down to Columbus and I was able to listen to OverEasy, one of my favorite programs. It totally reminds me of Sunday mornings working in the snack shack at The Fort Golf Course. I'm super excited because I just found out that you can listen to the radio online! X - So, I was going to get Olivia a xylophone for Christmas, but after 5 minutes of listening to Olin bang on his, I seriously changed my mind! Look at how cute her belly is!! 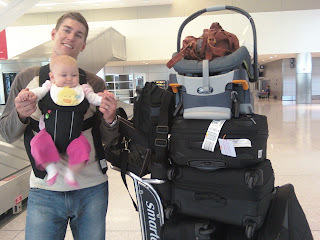 Y - (This one is a stretch), but YOU should have seen us with all of our luggage! Going back to our car at the Santa Barbara airport looked a little something like this: Me, pulling two bags, carrying David's brief case, a dog duffel without a dog but holding a purse, and walking Magnum on his leash AND David with two large bags, wearing Olivia in the carrier, the diaper bag and the carseat and base. Yeah, we don't do anything easy! Z - Ironically, two of my favorite restaurants in Columbus both start with Zs. On Sunday night, we ate at Zwanzig's and then on Monday afternoon we ate at the revamped Zaharako's. Zaharako's is an old fashioned fountain soda shop and ice cream parlor. We used to go there when I was a kid and it was getting pretty run-down. It has recently been renovated and is just absolutely amazing inside. 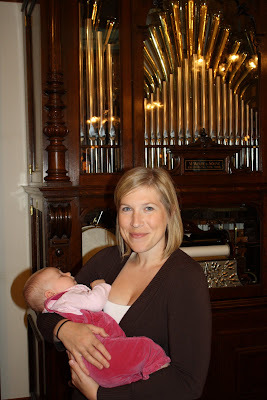 Olivia kept true to her form and fell completely asleep during the entire visit - even when the giant organ started playing! A huge thanks to my friend Trish for leaving work to come and see us at Zaharako's! I miss Indiana ALREADY and I miss you too! No matter where we go, we will always be Hooisers...ther's just something about cows and corn and soybeans and the smell of fall that no other place can compete with. What a neat way to recap your visit back home (and OHIO). Your Dad and I are thankful we had the opportunity to share in some of those experiences with you. It was good to visit with friends and family but we are glad to be back home in AZ. Keep these neat blogs coming I love them. You put so much thought and work into this blog and I loved it! I have been such a blog slacker lately.... Glad you guys had a great trip. 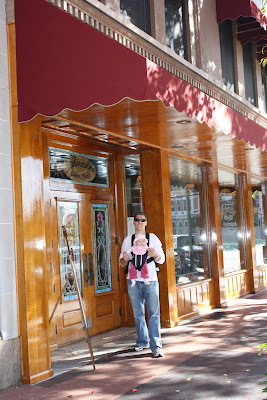 LOVE this post, all the pictures, and your adorable bloggy style. THat picture of you and David in the dive is super cute and I love that picture of you and the sleeping Livi Lu at the end. Precious family.